This is a preliminary post comparing the basic data for a representative selection of UK brokers. 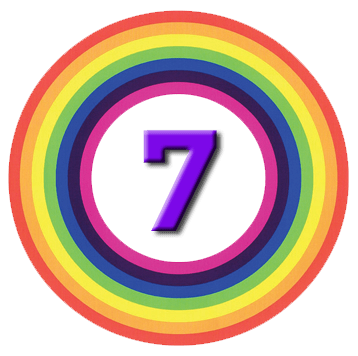 I’ll use this data to draw up a short list of promising candidates to be examined in more detail – across the account sizes and trading profiles of our 7C investors – in a later post. Comparing broker costs is time-consuming and complicated – each broker seems to want to be competitive in a particular segment of the market and not across the board. As you will see, at the portfolio sizes and trading frequencies we are most interested in, the differences between the main contenders are not as significant as you might expect. Costs of the underlying ETFs, investment trusts and funds that we will invest in will have more impact on our final returns. Note that today we are interested primarily in costs associated with listed products (stocks / ETFs / investment trusts). It is to be expected in any case that listed products will make up the majority of our portfolios, since they are usually lower cost and have liquidity advantages. Although the tables below give some information on fund charges, costs here are much more opaque, since many funds offer different charging structures on different platforms – so-called “super clean funds” offer discounts to leading brand platforms. New money now goes into “clean funds” which don’t pay platform commissions – instead the platform charges a separate fee. Old money can be moved over now or by April 2016. We will return to this area in a later post. Looking at the flat fee brokers, Interactive Investor wins for SIPPs, and iWeb for ISAs. The Share Centre and Motley Fool lose out because of per-stock exit charges, and Alliance Trust and Halifax lose out because of high dealing costs. All of these brokers charge for fund dealing and are only recommended here for listed products. iWeb is new to me and its range of stocks / ETFs / investment trusts will need further investigation. It’s worth noting that the range of annual percentage charges is quite small (0.01% to 0.13% for ISAs and 0.05% to 0.19%). This is partly because of the large size and long duration of the portfolios under consideration, but also because these tables consider only the inevitable costs from the platform. A real-world portfolio would also incur stamp duty at £5 per £1000 on UK stocks; an additional dealing charge when cashing in a stock during drawdown; and charges from within ETFs, investment trusts and funds in the portfolios. The Monevator article goes on to compare percentage fee brokers and share brokers. I have included only a selection of these as most are more expensive than the fixed fee brokers for portfolios of our size. In particular the lack of a capped annual charge on listed products makes them unsuitable for our purposes. 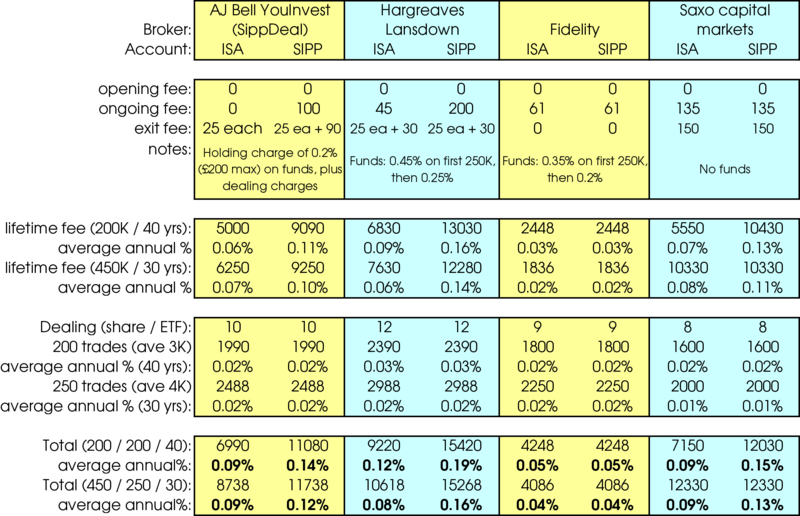 Charles Stanley has a cap of £150 and slightly lower exit fees which make it comparable to YouInvest in the table below. Those included in the table are either of personal interest because I hold accounts with them, or are broadly comparable to the fixed-fee platforms. If you’d like another broker added to the table, just let me know. Over my own investment career, I have held accounts with many of the firms in the tables above, with others on the Monevator page and yet more no longer in existence. I currently hold accounts with YouInvest (listed products), Fidelity (funds) and HL (both). Of these only Fidelity appears to be competitive, which was a modest surprise (though conditions were very different when each of the accounts was opened). Whether it is worth me moving many lines of stock so late in the game for me is debatable. My advice to those just about to choose would be to make sure that your favourite firm matches your long-term investment plan, rather than the trades you have in mind for the next 12 months. Then hope that they will be around for the long-run, and will have comparable terms. The good news is that the trend on fees to retail investors has been downwards throughout my career and I expect this to continue. As long as you choose sensibly in the first instance, you are likely to at least get the deal that you bargained for. As always, a change of plan mid-career may mean that you need a new broker. I will carry forward iWeb, Interactive Investor, YouInvest, HL and Fidelity to a future detailed analysis of our 7C portfolios. No matter how great the talent or effort, some things just take time: You can’t produce a baby in one month by getting nine women pregnant.